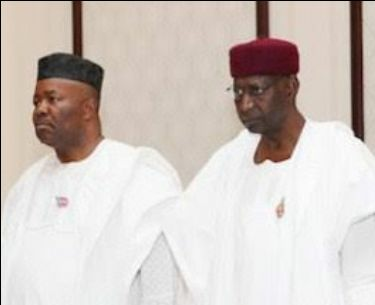 Former Senate Minority Leader, Godswill Akpabio is said to be making effort to take over the job of the current Chief of Staff to President Muhammadu Buhari, Abba Kyari. Though difficult to believe, a source within the presidency hinted that, Mr Akpabio’s defeat at just concluded NASS election had left him with no option than to see how he could remain relevant in APC leading government. This source added that, the lawmaker in the last 48 hours has had a couple of meetings with close confidants of Mr President and top officials to discuss the move. “Akpabio is proposing that, should Buhari appoint him, a Christian from the core southern part of Nigeria into such a sensitive office, the current notion, that Mr President is shielded by a cabal controlling the affairs of the state, will die a natural death. Akpabio is expected to tie the knots on that appointment with President Muhammadu Buhari as the latter is scheduled to visit Akwa Ibom State on Monday on a thank you tour where he will have a town hall meeting with a cross section of people from all walks of life. The presidential advanced team have already checked into Bexco Hotel and Suites, 24 Abel Damina Avenue, Osongama Estate, in Uyo, the Akwa Ibom State capital. The other presidential advanced team scheduled to be in Imo State have moved over to Delta State in anticipation of the president’s visit. The presidential source revealed that part of the Akpabio’s plan is to use the town hall parley in Uyo to instigate the audience to call for the redeployment of current top staff of INEC in the state, which should pave way for the ruling All Progressive Congress (APC) to take over the oil rich state. The former Governor of Akwa Ibom State had made similar inroutes into the presidency during the Goodluck Jonathan era, knocking off the like of former Governor, Rotimi Amaechi, who eventually left the PDP in acrimonious circumstances. Abba Kyari was appointed Chief of Staff to the president on 27th August 2015. He was preceded by Brig.-Gen Jones Oladehinde Arogbofa and Chief Mike Oghiadomhe, who both served under President Goodluck Jonathan. Nairaland contributed to this report.